The following are areas to work on to help the way search engines see your website. SEO Description – This is the description of the page and is typically included as the paragraph under a search result that describes the content of the page. The description provides information in search results under a website's page title and encourages someone to click on the link. Keywords – Most search engines, including Google, completely ignore keywords for search ranking because they are too easy to game. Many people choose to leave these completely blank, however, keywords can be used to specifically clarify the purpose on a web page. Because keywords are easy to game and are generally ignored by search engines, it's recommended to not focus heavily on this area if you are looking to increase your search rankings. Text Content – Search engines use the HTML Text Tags to index the structure and content of your web pages. This helps them better understand the information found on your site. <h1> headings should be used for main headings, followed by <h2> headings, then the less important <h3>, and so on. Showit automatically applies Text Tags based on the Font design settings you are using. You can read more about HTML Text Tags here. 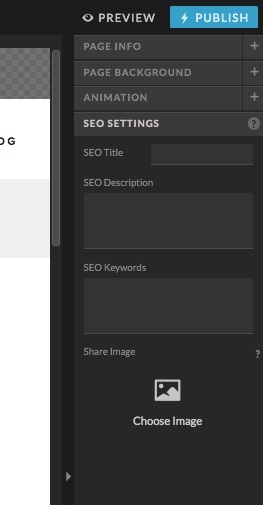 Images and Media – Under the preview of an image, there are options to add an SEO Title and Description used as the title and alt tags for SEO purposes for an image in the page. 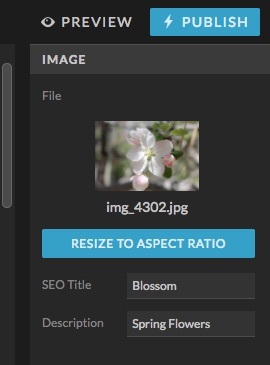 These can be used to determine how Search engines index the file without relying on potential generic image names.